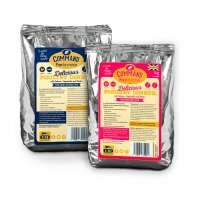 Cat & Ferret Foods - CSJK9 Ltd. Although better known for their dog food, CSJ also make small animal food such as cat food and ferret food. A very popular, complete dry cat food used by catteries, breeders and pet owners. Based on the recipe of a leading brand... 15kg bag. CSJ Ferret is a complete, fully balanced recipe which is chicken and salmon based with the necessary high percentage of protein and fat to help maintain body condition and support stamina when working. It has been specifically formulated for adult ferrets but can also be used for kits when soaked.